Do you sometimes wonder about your emotions and how you react a certain way? Well now you can put a face to those emotions of yours - Joy, Anger, Sadness. These emotions can wreak havoc during life-changing moments. 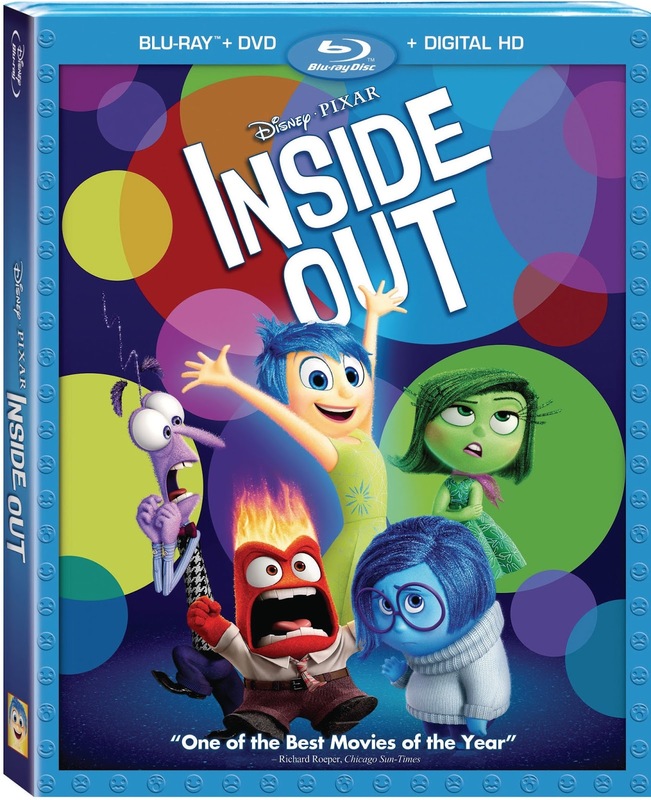 Disney released a Digital HD version of Inside Out on October 13th but if you still haven't seen this movie then the Blu-Ray DVD is scheduled to be released Nov. 3rd - just a few short days away. This is a really great movie for both kids and adults. I'm sure we can all relate to Riley (Kaitlyn Dias) a happy, hockey-loving 11-year-old Midwestern girl, but her world turns upside-down when she and her parents move to San Francisco. Riley's emotions -- led by Joy (Amy Poehler) -- try to guide her through this difficult, life-changing event. However, the stress of the move brings Sadness (Phyllis Smith) to the forefront. When Joy and Sadness are inadvertently swept into the far reaches of Riley's mind, the only emotions left in Headquarters are Anger, Fear and Disgust. This movie will have you going through all of your emotions and have you laughing as well. We really enjoyed watching this movie and laughed a lot! My daughter was glued to my tablet watching the movie and she also had a great time coloring the activity sheets, putting her puzzle together and it just so happened that we also got a poster recently when we bought some books at school. The activity sheets and puzzle provide endless entertainment. If you haven't seen all the awesome activity and coloring sheets I posted last week along with some great recipes, you can check out the post here. One lucky follower will have the chance to win (1) Inside Out Digital HD Code Card by entering a Rafflecopter giveaway. Thanks for visiting & good luck!